Kids, Cows and Grass: Farming's a gamble--weather affects everything! 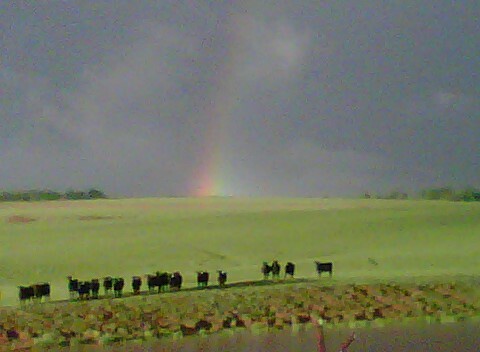 Farming's a gamble--weather affects everything! I've heard it said that if you're a farmer (or rancher) you don't need to go to a casino to gamble. You do it every day! We plant the field of soybeans, not knowing if it will rain enough for them to sprout, or if once they are sprouted it turns off dry and hot (like this week) and they will all wither and die. A farmer is never happy with the weather...if it is dry, they want rain. If it is wet, they need it dry! I have to admit, in our neck of the woods, we've received pretty timely rains this year and I have heard that the wheat harvest was pretty good. But this week we've had the infamous Kansas winds blowing hot and dry from the south, drying up fields and baking the ground. We have big cracks in the ground and the leaves on the corn are all curling up to protect their meager water in the plant. Temperatures over 100 for a few days in a row can be pretty damaging to the crops. Drought is nothing new to Kansas. It is a cycle that we go through pretty frequently. That doesn't make it any easier to deal with THIS year as the farmers in western Kansas watch their soybeans shrivel and die or their cattle hide in the shade all day instead of grazing. In 1935 Kansas endured a wide-spread drought and the editor of the Emporia Gazette William L. White wrote a prayer for rain as his editorial. It was said that if you hung this prayer on the wall and repeated it every day, it would rain within the week. So for my western Kansas friends, I am reprinting this prayer from the Emporia Gazette. "Oh Lord, Let it Rain!" "O Lord, in Thy mercy grant us rain, and by that we don't mean a shower. We want to go out and watch the lightning rip across the southwestern sky in hot blue forks as the fat clouds roll in on us. We want to hurry home to close the house with the first fat drops the size of marbles, on a suddenly rising wind, chasing us and plunking on the car hood. We want to scramble all over the house, just as the first sheets descend, frantically slamming down the windows. "O Lord of Hosts, we want to look out of the windows and watch the regiments of close-packed raindrops march diagonally down. We want to hear the gurgle of the gutters under the eaves, and then the sputter of the downspout. "God of Israel, Isaac, and Jacob, let it come down so hard, let the drops dance so high that the street and sidewalks seem covered with a six-inch fog of spatter-drops. Then let it just keep up for a while, and then begin to taper off, and then turn right around and get a lot worse, swishing, pounding splattering, pouring, drenching, the thunder coming--crackity--BAM--and the lightning flashing so fast and furious you can't tell which flash goes with which peal of thunder. So that all the women will get scared and climb on top of the beds and scream at you not to get too close to that window. "And then, O Jealous God, repeat the whole act about three times, and in the middle of the second time we will climb the attic stairs and put the wash pan under that tiny leak in the roof which usually you can't even notice in an ordinary rain. And after a couple of hours, kind of taper it down, O Lord, to a good steady rain--not a drizzle, but a businesslike one that keeps up until just about dawn and then spits a few drops occasionally during the morning from the gray sky. "Kansas is indeed the Promised Land, O Lord, and if it gets a break it will flow with milk and honey. But we can't live much longer on promises. So in Thine own way and in Thine own time, make up Thy mind, O Lord, and we will bow before Thy judgement and praise Thy everlasting name. Amen." It's amazing how quickly things change in farming and ranching. We're currently battling with the 100 degree temps but our crop land is under water and will be until August. Quite a catch 22 we've found ourselves in.